Just finished a Trinity OSD kit and it sounds fantastic! They are super responsive to questions and their provided documentation is second to none. Can't recommend this kit highly enough! The Trinity Amps OSD is modelled after the 100W Dumble ODS #124 with just a few less frills. It boasts a nominal 22W / 6V6 or 33W / 6L6 output stage in a compact chassis format of only 17 in W X 2-1/2” in H X 8-1/2 in D . It has one foot-switched channel – Clean and Overdrive. The amp uses 6V6 output tubes in fixed bias mode with an option to run 6L6 power tubes. Since most on-stage set-ups are miked, 100 watts power is almost never required and 22 watts is both sufficient and surprisingly loud even for medium gigs, especially in this design. This lower wattage helps keep volume levels manageable and makes it very useful in a studio. The preamp has three 12AX7 tubes which are used for the Clean channel, Overdrive channel and the Phase Inverter. On the back of the amp there is a control to configure Overdrive channel Trim. The Overdrive channel and Pre-Amp Boost (PAB) are activated with a footswitch connected to the back of the amp. There is also a passive effects loop, like in the originals. This is very effective if, for example, you want to inject some reverb. We have used a Holy Grail Reverb pedal here and it works very well. There is an option for a buffered effects loop. The “spanky” clean preamp has a percussive nature is extremely inspirational. This preamp stays nice and clean and allows you to crank the power amp to achieve a highly percussive tone that taps into the compression and sustain of the power amp tubes. The amp has one input going straight to the first tube stage. No FET input. The output section uses a standard long tail pair phase inverter utilizing negative feedback. Since there is negative feedback, the phase inverter section of the amp also features a Presence control to add sparkle and clarity to your tone. There is a Master Volume control prior to the phase inverter which is very effective at setting the overall volume of the amp. The power supply uses a diode full wave rectifier and is unique in that it employs a lot of filtering in the power supply (100uf / 50uf X4) . The large filter capacitors help keep the tone tight and focused especially in Overdrive mode! On the back of the amp, there are two speaker output jacks, a 4-8-16 ohms speaker impedance selector, passive effects loop, OD trim control and Mains and High Voltage fuses. The Overdrive channel and Pre-Amp Boost (PAB) are activated with a two-button footswitch. Both the channel switching and PAB switching is done by two relays inside the amp. The PAB accentuates midrange frequencies and attenuates low frequencies, making it great for cutting through during a solo. Engaged, you will also notice an increase in gain and distortion characteristics. This is useful for pushing the power section, lead boost and getting a bit of extra dirt from the amp. The Overdrive channel consists of two cascaded triodes being fed from the clean channel signal. Gain is attenuated before and after each of the two triode stages in the Overdrive channel. This limiting of gain keeps the amp smooth and prevents over the top harsh distortion tones. The Overdrive channel features two front panel controls – Rati, an OD master volume control and Level which adjusts the amount of gain and distortion in the overdrive mode. On the back of the amp there is a Trim control that controls the amount of signal sent into the first stage of the Overdrive circuit. The OSD design is well thought out from a builders perspective and uses a single eyelet board and a single relay PCB. 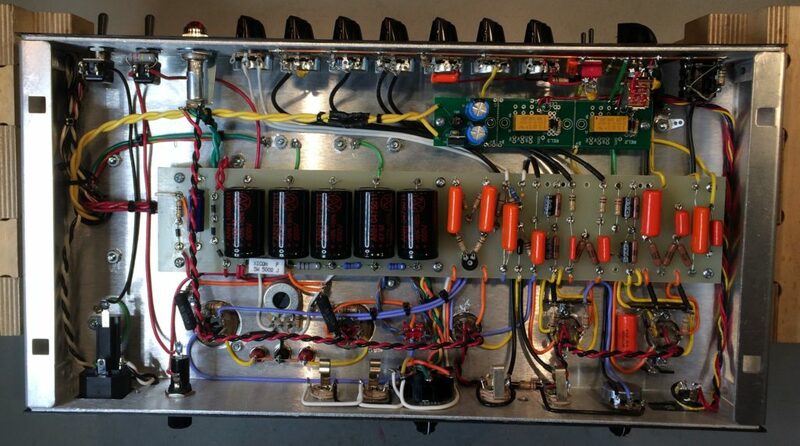 Parts selection, lead dress, voltages and tube selection are critical in getting a great sounding amp. Order Below at Introductory Pricing! Kit Includes Custom Heyboer Transformer set – PT & OT (over spec’d) Made in USA to our critical specifications. Tube Recommendation: NOS RCA 12AX7 for V1 (Clean channel); Mullard reissue 12AX7 for V2 (Overdrive channel); Tung Sol 12AX7 for Phase Invertor V3; Tung Sol 6V6 power tubes. Just like with my first Trinity kit build (a TC-15) this build comes via a significant milestone in my life. I received a small inheritance and decided that I would honor my parents musical legacy with two “dream purchases” – a beautiful Ibanez Artstar AS153 and a Dumble-inspired amp build – the Trinity OSD kit. The actual build went very smoothly. I did have one small issue on power-up that had me really scratching my head for about an hour but once I finally identified the problem I got it fully operational quickly. This was probably the second most-complicated build I have done (out of a dozen or so) so I was very happy with that. (Love the relay boards… gonna have to see if Stephen will sell me a couple of those on the side.) Probably the only thing I will change is eventually I would like to put a 5-pin DIN jack on the footswitch jack itself so I can just use a standard MIDI cable for the connection. That will make it easier to permanently mount the footswitch box on my pedalboard. Sonically, this amp does NOT disappoint! This thing is a tone beast. The cleans, even with 6V6’s, have more than enough headroom for my live needs. I will eventually try 5881’s and 6L6’s though to see how a slightly stiffer output tube performs. So far, I have tried it extensively with my Godin Session (my HSS “practice guitar”.) This strat variant sounds very nice with the ODS, especially in the clean channel. The guitar that really sounds amazing though is the Ibanez Artstar. As an ES-335-inspired guitar, sounds absolutely fantastic with the ODS both in clean and in OD modes. Lots of bloom and when pushed it gives you that satisfying growl and touch sensitivity that the Dumbles are so famous for. I have not given it a workout with my pedalboard yet because I want to see what I can coax out of the amp without it first… this amp may end up shrinking my gigging pedalboard! So far I can’t see the need for all four OD pedal currently on there with this amp. I did a little recording with it in my studio using my Suhr Reactive Load and Torpedo Wall of Sound IV for cabinet/mic impulse responses for silent mic-free recording. I had been using Scuffman Amps S-Gear for recording quite extensively lately because you can get some really good sounds out of this amp-sim plugin. One song in particular that I did extensively used the “Duke” amp sim which is modelled after Robben Ford’s #102 Dumble amp. It did a really good job of capturing that sound with my G&L Tele and I had it sounding pretty darn good, or so I thought. I re-tracked one of the lead tracks with my Ibanez and the ODS/reactive load combination and WOW! I threw a little reverb on it with Abbey Road Plates plugin and the track came out AMAZING! Soooo much better than the S-Gear attempt, which like I said, actually sounds really good as well, but the real amp “feel” is just “there” with the actual ODS in the mix. I’ll try and retrack the whole song with this setup this week and post a link to the final all-ODS version. My favorite cab impulse response is a 2×12 loaded with WGS ET-65’s, which is also the speaker in my live rig. I probably won’t post pics of the guts. My wiring looks good but my eyelet board building is not the neatest in the world. It’s only a matter of personal preference but I much prefer turrets. I just get much neater looking and (for me) more serviceable builds with them, but I know there are those who feel exactly the opposite so don’t interpret that as a criticism at all. Once I get my custom head cab from Stephen, I will post pics of that. I have a feeling it will be very nice indeed! Then I will have to decide if I want to build my own speaker cab to match or just have Stephen build me one. Passive Effect – In / Out. Optional FET buffered effect loop with pre-amp out. OSD kit with all components except tubes and cabinet.